Varanasi, Jan 22 (IANS) India and Mauritius reviewed the entire gamut of their bilateral ties and discussed ways to further expand cooperation in areas like Blue Economy during a meeting between Prime Minister Narendra Modi and his Mauritian counterpart Pravind Jugnauth on the sidelines of this year’s Pravasi Bharatiya Divas (PBD), the Indian diaspora conclave, here on Tuesday. “The two Prime Ministers reviewed the entire gamut of the long-standing and time-tested strategic relationship between both countries, based on deep emotional bonds of kinship and culture,” the External Affairs Ministry said in statement. It said the the talks focussed on initiatives to further strengthen the bilateral ties, including finalisation of the Comprehensive Economic Cooperation Partnership Agreement (CEPCA). India is Mauritius’s largest trading partner and has been the largest exporter of goods and services to the Indian Ocean island nation since 2007. “The various ongoing bilateral development cooperation projects were discussed and new proposals for critical partnership projects in health, disaster management and energy were agreed upon,” the ministry statement. Earlier, delivering the keynote address as the chief guest at the inaugural ceremony of the PBD here, Jugnauth lauded India’s economic growth under Modi and commended New Delhi’s efforts to reach out to the Indian diaspora across the world. He also announced that Mauritius is going to organise a Bhojpuri Mahotsav. Around 68 per cent of Mauritius’s total population of over 1.2 million are people of Indian origin. Most of them are descendants of indentured labour taken from India between 1834 and the early decades of the 20th century. Jugnauth arrived in New Delhi on Sunday on a nine-day visit to India. On Monday, he received Minister for Commerce and Industry Suresh Prabhu in New Delhi. “The Minister reiterated that India accords great importance to the steady development of umbilical relations between our two countries,” the External Affairs Ministry statement said. Prabhu too noted that the early finalisation of the CECPA would pave the way for giving a strong impetus to the close bilateral economic partnership. Later on Monday, External Affairs Minister Sushma Swaraj also called on the visiting dignitary in Varanasi. 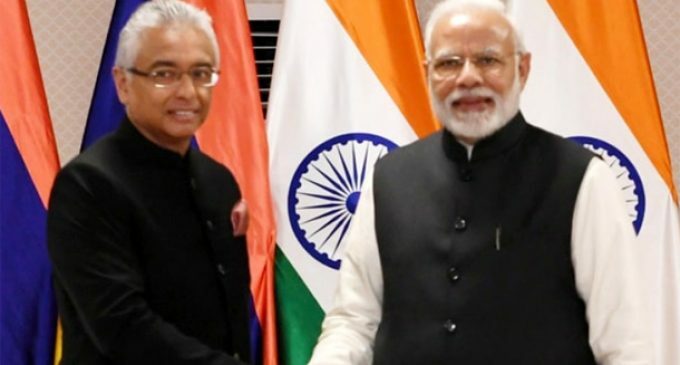 “She noted that India-Mauritius bilateral cooperation was comprehensive and multi-faceted and that our bonds date back centuries,” the statement said. “Our close multifaceted relations have steadily developed over the years, based on the secure foundations of kinship and family ties, and of shared values of democracy, tolerance, peace and development,” it stated. On January 24, following the conclusion of the PBD, the Mauritian Prime Minister will visit Prayagraj for the Kumbh Mela and then proceed to Mumbai where he will inaugurate the wholly owned subsidiary of the State Bank of Mauritius (SBM).